Picking up from the last episode, it's still the cocktail party and many guys are making excellent impressions with Rachel. 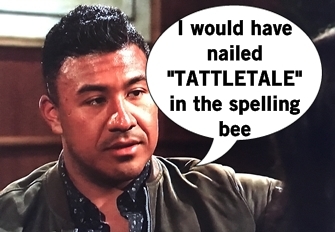 But then there's Lee, the instigator who after antagonizing Eric decides to interrupt Kenny's alone time to show Rachel that he can carve words into wood. Dean points out Lee's "intolerance" but its not dwelled on much because Kenny is more upset by having his time interrupted. 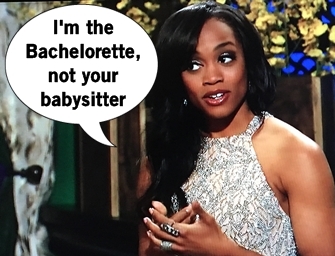 Rachel is feeling a lot of pressure being the first black Bachelorette and let down by the men's drama, pretty annoyed by the whole evening. She calls the Rose Ceremony to order and explains the good conversations helped her get through the nonsense occurring that night. Diggy and some other guy I don't know don't receive roses. The AirBnB rental of the Bachelor mansion is up, so Rachel and her men head to Hilton Head, South Carolina for the next round of dates. Dean gets the first 1-on-1 date where they get to ride in the freakin' Good Year blimp. Blimps are a dream for Rachel, but a nightmare for height-hater Dean who slightly loses his mind. Nothing a little hand holding (and kissing) from Rachel can't help. Plus the Good Year blimp flies by to inform the men that this is in fact Rachel and Dean's super awesome date. Rachel and Dean move along to the quiet dinner portion, where he talks about his mother passing away from breast cancer and dear god is it sad. But wipe those tears away because there's a concert for Rachel, Dean, and cheering women by a random country singer to close out the night. Still nursing the wounds of the Good Year blimp's sick burn on them, the group date card arrives to invite men out for a boat ride. The group imbibes some cocktails via Krazy Straw which leads to some poor dancing, poor rapping, a makeshift Limbo competition, and then the guys showing off how many pushups they can do. Rachel also re-enacts the "King of the World" Titanic moment, a true staple of sailing. But this is all just a lead-up to departing the boat to compete in a spelling bee, judged by children. If you're wondering, some of these guys are terrible at spelling (Peter, you won't have coitus if you can't spell it). Josiah wins the spelling bee with the final word of "polyamorous" and the most amount of time BSing. 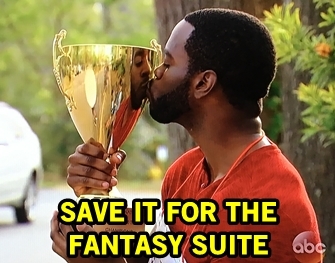 The date still goes on with a night portion, which Josiah move along from kissing to sipping booze from his trophy. Rachel and Peter continue to grow closer, with her being open to the idea of moving to Wisconsin. She also enjoys time with Eric and sharing her love of cleaning (he likes hugs). Continuing his streak of being that guy who has nothing to talk about but other guys, Iggy tells Rachel that Josiah isn't right for her. Continuing the streak of throwing men under the bus, Lee babbles on about his argument with Kenny. And so Kenny has to follow-up another meh freestyle with defending the shouting match he had with Lee. Kenny feels worried that Rachel doesn't believe his side and heads inside to get Lee. So, this is how the first 30 minutes will begin next week? Wonderful.